Are you in the midst of a research paper? For many law students, it's that time of the semester. Academic Search Premier, now known as Academic Search Complete, is the interdisciplinary articles database that most students know best. But don't overlook Academic OneFile, another outstanding source of scholarly full-text articles from law-related disciplines available to all Hofstra students. As a "Library News" item from the Hofstra University Libraries mentioned this week, Academic OneFile's peer-reviewed and other scholarly and news articles can be searched by subject and other useful filters. It now offers more than 50 million articles published between 1980 and 2012. With extensive coverage of journals in science and technology, medicine, business, theology, the social sciences and the arts, Academic OneFile is a good choice for research topics in bioethics and health law, law and economics, and issues at the intersection of law and psychology, education, and religion. You can link to Academic OneFile from the University Library homepage under "Research Databases" and access it remotely via your Hofstra network login. Happiness has become a hot topic for serious research. The World Database of Happiness is "an ongoing register of scientific research on the subjective enjoyment of life." It examines happiness in nations, trends in nations and makes comparative analyses. This site provides detailed statistical and scientific analysis and references so be prepared to be serious about happiness. Members of the Joint Congressional Committee on Inaugural Ceremonies and others gathered on the West Lawn of the Capitol for the First Nail Ceremony. 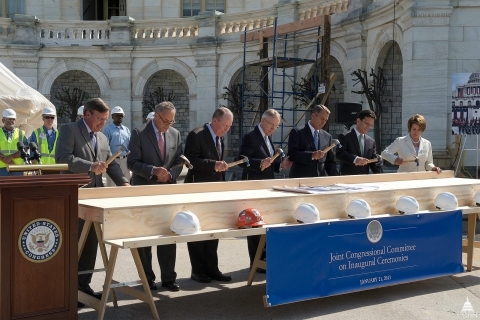 Members of the Committee gathered to hammer the first nails into what will soon become the 2013 Presidential Inaugural platform. "The event was only the second public meeting of the committee since it convened in March. The members are, as tradition dictates, culled from House and Senate leadership, with Senate Rules and Administration Chairman Charles Schumer (D-N.Y.) at the helm. The other members of the committee are: Senate Rules and Administration ranking member Lamar Alexander (R-Tenn.), Senate Majority Leader Harry Reid (D-Nev.), Speaker John Boehner (R-Ohio), House Majority Leader Eric Cantor (R-Va.) and House Minority Leader Nancy Pelosi (D-Calif.)." Social media is slowly but surely making its way into every aspect of our lives. Now, Iceland, who has been soliciting "crowdsourcing" to make changes to its Constitution, has just approved their collaborative approach to the law of the land. Crowdsourcing has become a buzzword of sorts lately, to describe the use of a large, inexpensive and temporary workforce to create new content, solve problems and innovate. This is especially revolutionary in the legal community, where social networking is often looked at askance and with great suspicion. The Iceland Constitution, the embracing of crowdsourcing, and the government's willingness make it an official document...it's a bit revolutionary. The rest of the global legal community, most importantly legislators, letting anyone, trained or untrained in the law, comment and participate in the drafting of legislation seems impossible now, but could be in our future. Read more about crowdsourcing here at CBS news. Smithsonian.com | History & Archaeology is a great site for the latest in U.S. history and archaeological insight. It offers such gems as "Recapping the Jetsons" or "The Great New England Vampire Panic". The articles are scholarly and offer context for the time period under discussion. Click on the "Games & Puzzles" tabs for a fun way to find out how much history you know. Statistics research can often be cumbersome and require checking many sources. One great source that can help with this is the "Statistics Resources and Big Data on the Internet." This is a comprehensive listing of statistics, big data resources and sites on the Internet that is updated frequently. The sites in this resource can help to locate the latest statistics resources applicable to many different areas, research topics and more. Click here to access the resource.